Bone broth is an ancient food that traditional cultures have used for centuries to heal the body and strengthen the bones. So, yes there is a very good reason why Grandma’s chicken soup tastes so good when recovering from illness. Modern research now understands why broth has so many healing properties and is so beneficial to your immune system. One reason is because of its high gelatin and collagen content, which supports both the gut and the digestive system. And nutrients from bone broth are easily absorbed, because its rich in essential amino acids (protein) that are in an easy-to-digest bio-available form. 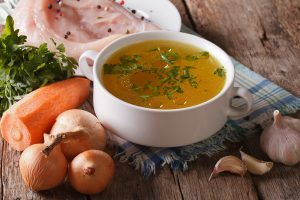 These vital nutrients found in bone broth include several amino acids that are difficult to get from diet alone, including proline, glycine, glutamine and arginine. It also contains plenty of collagen, glucosamine and chondroitin sulphates, which support skin, hair, bones and join health. Recently, bone broth has regained popularity and is widely available in a powered form, providing a convenient way to get these essential amino acids and other important nutrients that are vital to stopping bone loss, improving joint healing and rebuilding bone tissue. I recommend Dr. Axe’s Bone Broth (dry powder) which can be found online and at many local health food stores. Although you can simply add powered bone broth to water, heat it up and drink it like a broth, I like the recipe below. 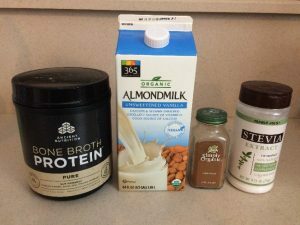 Add one scoop of Dr Axe’s Broth powder (20 grams protein) to 8 ounces of unsweetened (vanilla flavored) Almond Milk into a handheld shaker. Then add Stevia powder and cinnamon. The cinnamon is the key, it offsets the broth flavor and actually makes the drink pleasurable. Then shake it all up, pour into a glass and enjoy! However, making your own bone broth is not difficult to do and is highly recommended. And it’s certainly worth the effort because of the many health benefits, including better bone health, skin, digestion and immune function. Bone broth is made from slowly cooking bones, pieces of meat, vegetables and water. The key is to add a small amount of vinegar to the water, to improve the extraction of minerals from the bones. There are many bone broth recipes online, but my favorite resource is a book by Sally Fallon, “Nourishing Broth”, where you will find a wide array of recipes for beef, chicken, turkey, duck and fish broth and stock. Adding broths, soups and stews to your diet on a regular basis is one of the easiest and best ways to improve your bone health, skin, digestion, immunity, reduce joint pain and improve your family’s overall health. When you combine soups and bone broth with a sensible diet, exercise and the benefits of a micro-impact platform, you have an unbeatable combination for improving your bone health.